How has your summer been? We enjoyed an epic summer vacation at the cottage the last two weeks which saw over 30 of our closest family and friends visit us at our summer home. There's nothing like visitors to get you motivated to finish off your home projects! 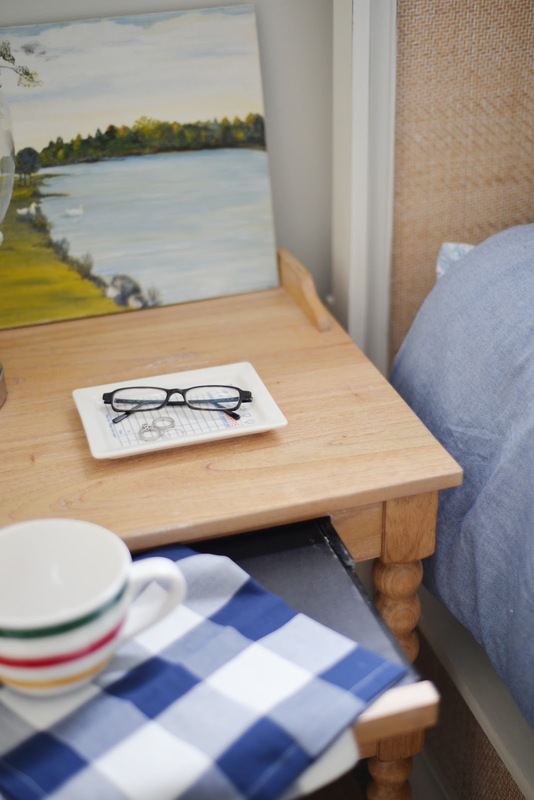 The cottage decorating is far from done but it is feeling more and more like the relaxing preppy modern country escape we envisioned. 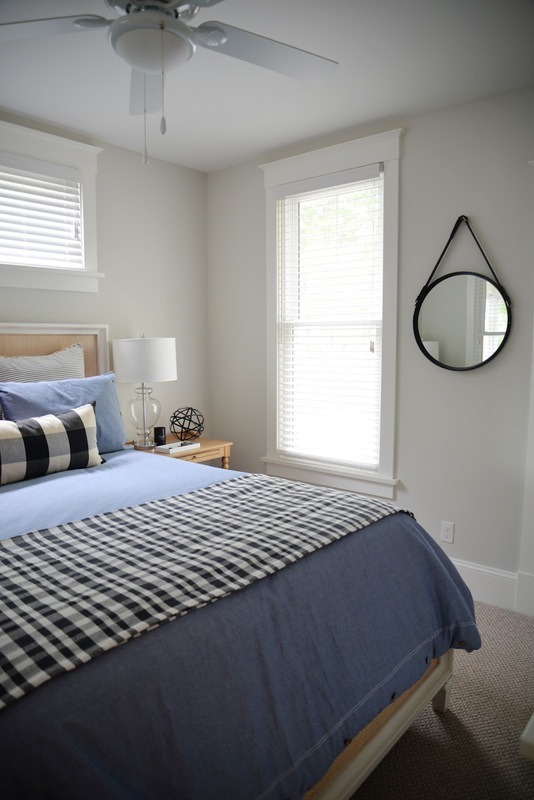 We painted our bedroom the palest of greys, Runway Coach P5213-24 by PARA Paints. 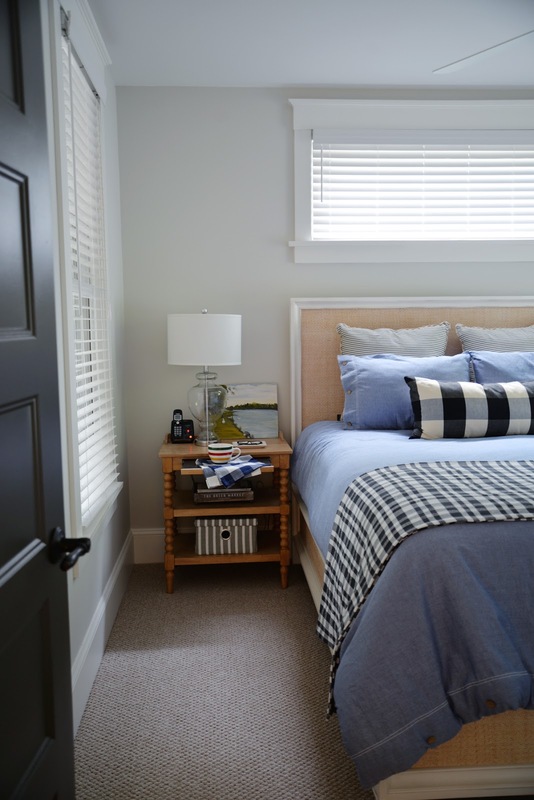 We want to keep the cottage light and airy and this light grey provides a subtle contrast and shows off the white trim and window casings beautifully. 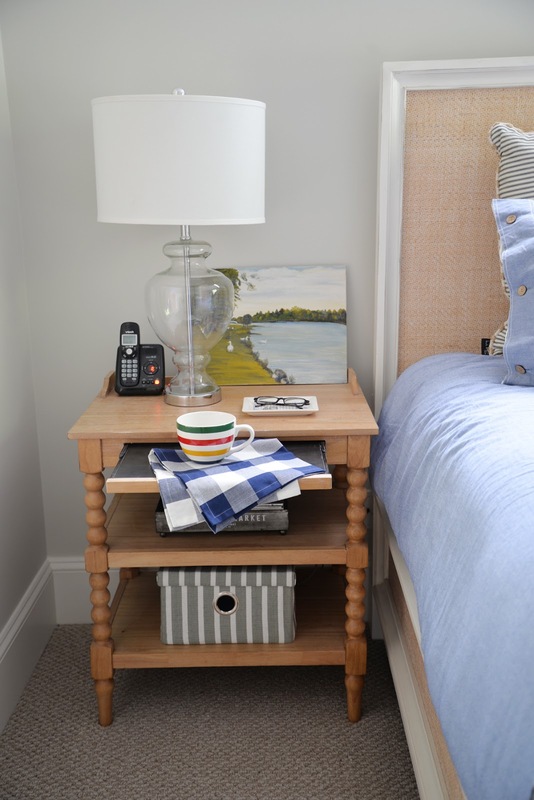 The nightstands and table lamps might look a little familiar. 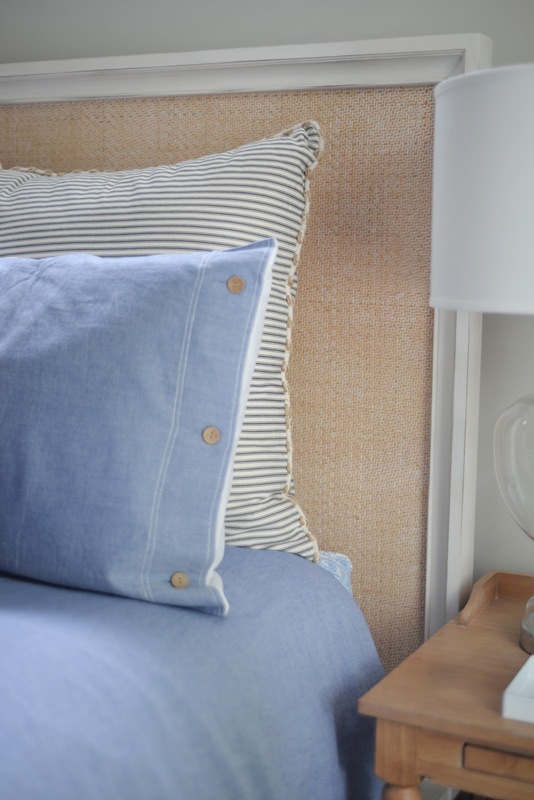 I had used them temporarily in our guest bedroom at home but they were always intended for our cottage bedroom. I like how the wood works with other natural accents like the rattan headboard and pillow buttons to add warmth and texture to the room. 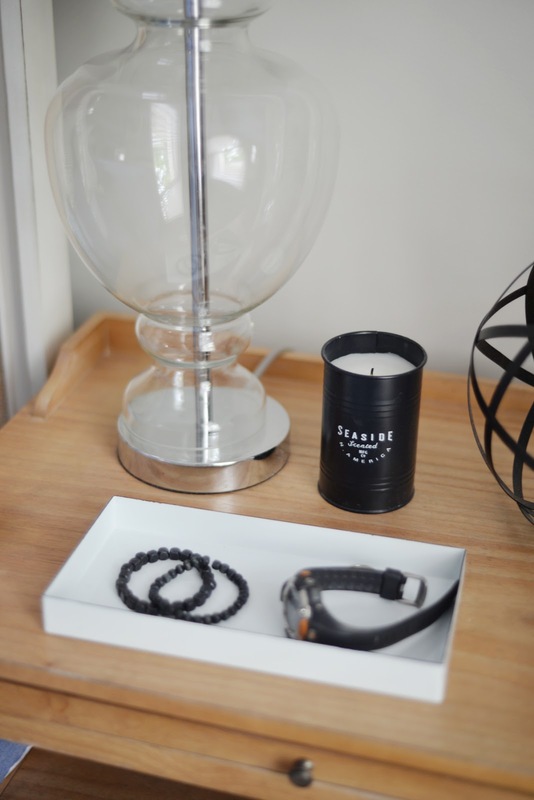 In contrast, hits of black bring a modern country edge. 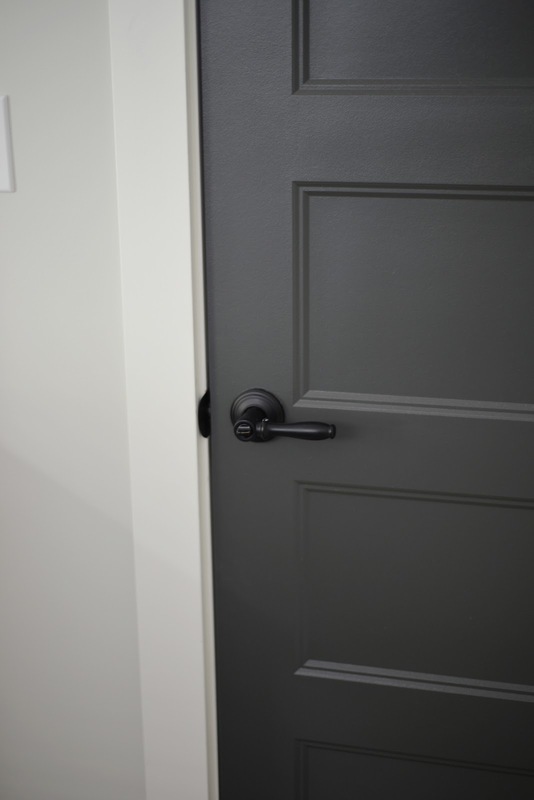 We switched all the builder's door handles and hinges for ones in matte black. It's such a simple change but makes a huge difference! I love these handles; they feel good to the touch and are easy to pull. They're the same ones we used throughout our basement. We've started to paint all the doors too. I've always admired dark doors but never felt they worked in our 1950's city home. Here, they feel graphic and earthy and just right. I went with Weathervane P2139-03 by PARA Paints, an almost-black colour with a hint of green. Notice how the handles almost but don't quite disappear against the doors? Love that! The round mirror with faux leather strap has been popular for a few years now. 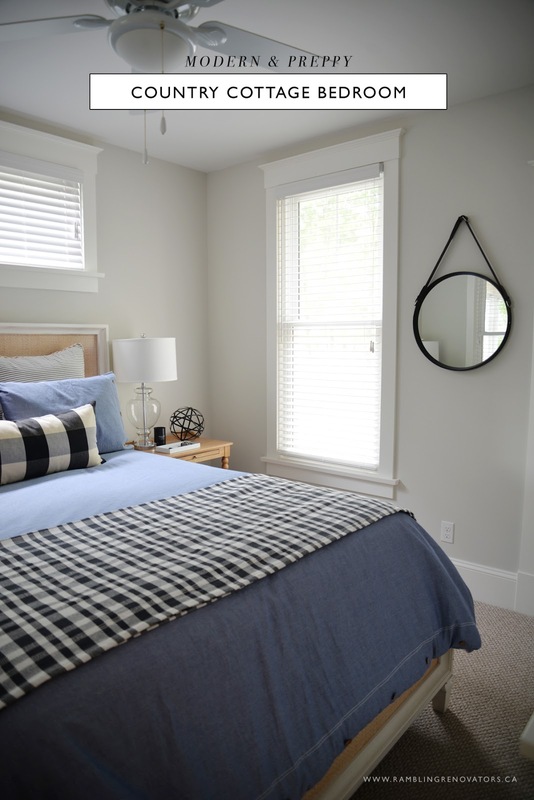 It's perfect for this space, nestled between the window and closet door. The round shape is echoed by the metal orb on the nightstand. 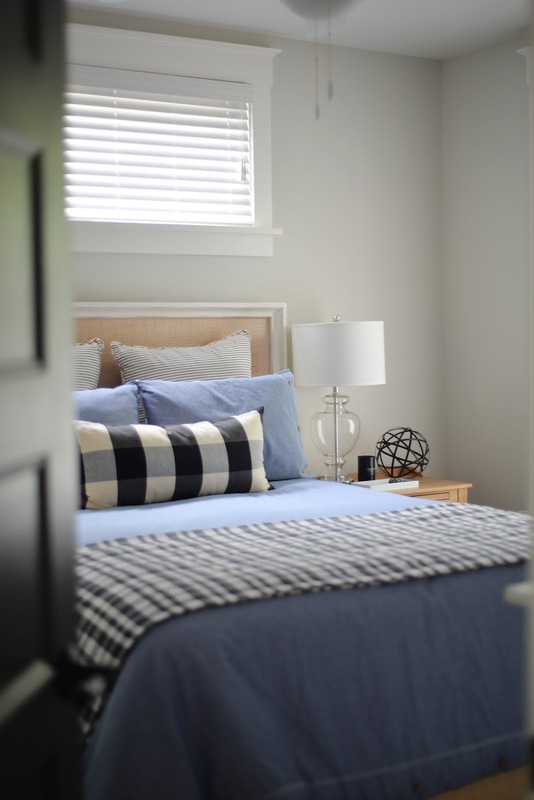 Other repeated motifs include the black and white patterns in the extra long Buffalo check pillow from Tonic Living and the plaid blanket, an inexpensive Ikea find. Ignore the camera lens and cap I left on the dresser (!) and focus instead on the cute little cuckoo clock. When I saw this at Muji, I had to have it. It emits the sweetest and softest cuckoo sound. A funny story: Sean and I would hear the cuckoo throughout the day but we couldn't recall ever hearing it at night. Surely we couldn't be in such a deep sleep that we didn't hear it?? It turns out that the clock has a light sensor and will not cuckoo when in the dark. How brilliant is that?! Those clever Japanese. 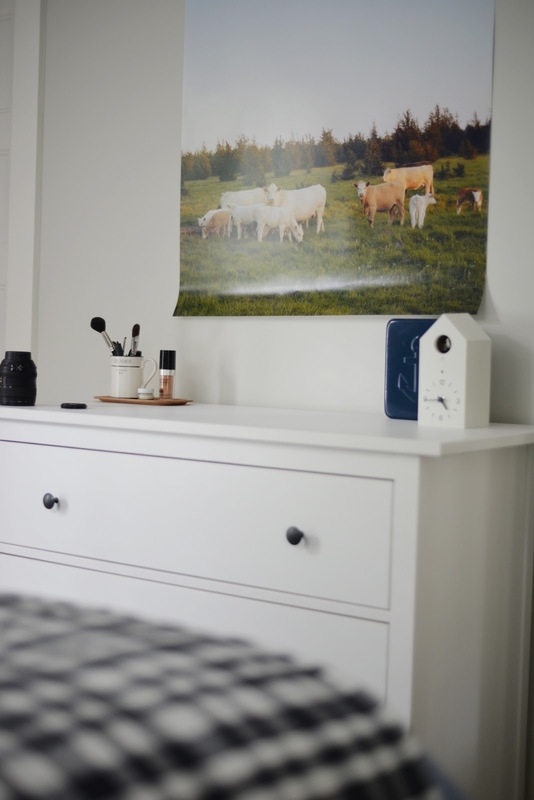 I also hung up a cow photograph I took recently with painter's tape, to see how I liked it above the dresser. I had it printed through Blacks.ca (how I miss their stores) in their new poster-sized prints. I really like the paper quality. It feels like photo paper as opposed to a poster paper. Fancy a cow print of your own? I've listed them in my shop. Anyone have any suggestions on where I can find a large modern frame for the print? There's still a few more things to do. I'd like to add drapery panels for a bit of colour and we'll see if I can convince Sean to add beadboard to the ceiling. Or I can call this room done for now and focus on the 374 other projects that need to be done. There's never enough summer weekends for us DIYers!